NBA Entertainment helped to produce Like Mike, which is why real NBA teams and logos, and real NBA stars playing themselves are all over Like Mike. The only fictional team is the Knights, the play in Southern California, in Staples Center, which is home to the Lakers and the Clippers. Oddly enough, neither team makes an appearance, except for the former, mentioned only in a spontaneous geometry lesson. The use of actual teams and players does lend some credence to the movie (unlike Juwanna Mann), but the overly touching and familiar story undoes this. Overall, Like Mike is an enjoyable fantasy, especially for children, but not much else. Otherwise, Like Mike feels like a blatant attempt to ride the coattails of commercial juggernaut Michael Jordan to bring in some ancillary revenue to the NBA. 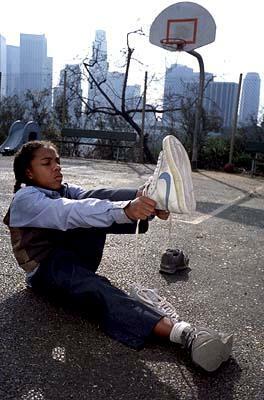 The movie is about Calvin Cambridge (rapper Lil' Bow Wow, All About the Benjamins, Carmen: A Hip Hopera), a young, short orphan who dreams of adoption. Calvin gets a hold of some sneakers that allegedly belonged to a famous, bald, basketball player. He finds the initials "MJ" inside, and once he wears them he finds he can actually play basketball well. At a Knights game, he wins a chance to go one-on-one with Tracey Reynolds (Morris Chestnut, Two Can Play That Game, The Brothers), and beats him. Frank Bernard (Eugene Levy, Serendipity, American Pie 2) signs him to the team because of the novelty factor and to help boost the Knights' sagging attendance numbers. Calvin's participation begins a winning streak for the Knights, and this annoys Reynolds because he feels that Calvin is stealing the spotlight away from him. So of course, Coach Wagner (Robert Forster, Human Nature, Mulholland Dr.) assigns Reynolds to act as Calvin's mentor and roommate. This movie is less about basketball and more about Calvin, so inevitably the two begin to have an effect upon each other. Calvin sees the father figure in Reynolds that he always wanted. In turn, Calvin's influence brings out Reynolds' paternal instincts, and causes him to curb some of his partying ways. It's not the most original idea for screenwriters Michael Elliot (Carmen: A Hip Hopera) and Jordan Moffet (Whispers: An Elephant's Tale), but they do a passable job of conveying the emotional weight behind it, plausibility aside. They don't spend enough time in the middle of the movie cementing the bond between Calvin and Reynolds, instead opting to focus either solely on Calvin or on the Knights' newfound winning streak. There are basically two incidents that the audience sees that help each person realize why they need the other. Director John Schultz (Drive Me Crazy, Bandwagon) would rather spend time on court, with Bow Wow (alas, he removed the Lil') dribbling and making shots around NBA players. As an actor, Bow Wow is not that great. He has two things going against him, he is still a kid, and he is a rapper/singer. The script fails to rise above anything else than a feel-good kid movie, and it only does a moderately good job at that. 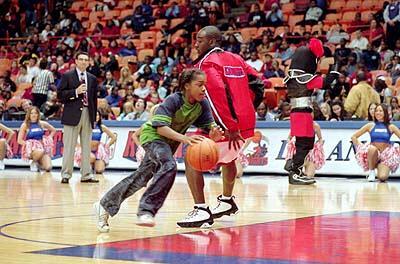 Like Mike is more a kid's fantasy-what could one kid do if he had the chance to play in the NBA? Schultz throws in a moral at the end, but still it is more of a kids vs. adults (with the main adult a spooky Crispin Glover, Bartleby, Charlie's Angels). All characters, especially the bad guys are broadly sketched. All Glover wants is profit, and he wants to use Calvin and prevent him from being adopted. Throw in an aging Jonathan Lipnicki (The Little Vampire, Stuart Little), who looks like he's milking his cute looks as long as he can before puberty arrives. In the end, Like Mike feels like a big commercial, albeit one with a little depth, for Lil' Bow Wow and the NBA. 1 hour, 40 minutes, Rated PG for brief mild language.